This fun and folky beer sign is hand carved and painted wood with a carved out beer mug. The condition is very good with wear in areas. 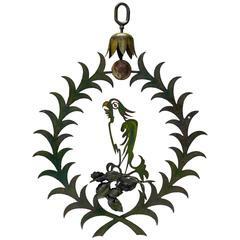 This oval sign id decorative and great for a bar in your home. 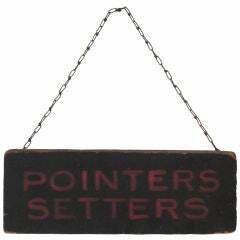 This original painted black and white trade sign reads Reserved for district. 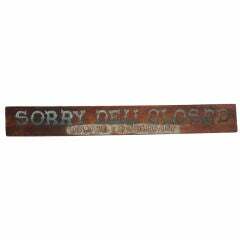 This cool one sided sign was probably from a old vintage court house. This double sided sheet metal with iron frame sandwich board reads : WE DO MACHINE QUILTING and it is on both sides. 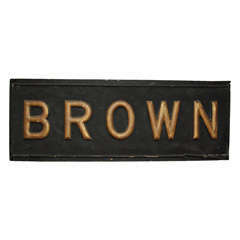 This is a all original painted double sided street or window sign. 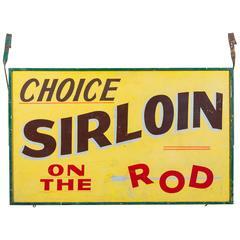 Very cool advertising sign in original paint. Red on black ground with the original chain for hanging outside at this dog breeding farm. All original and in great condition. Original English painted trade sign for &quot;Hammond Cash Stores&quot;. Untouched and original. wonderful patina. 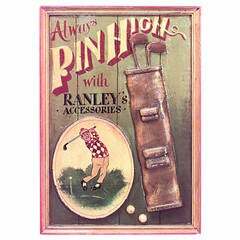 20th century British country painted and carved golfing outfitters sign or wall plaque which reads "Always pin high with Ranley's Accessories."